It is an established fact that with every month that goes by, an outstanding debt has a lower chance of ever being fully collected. At the 3 month and 6 month marks, there are dramatic decreases in chances of collection. Don't Wait! Time is of the essence. It is critical that your collection efforts begin before you lose your opportunity to collect the debt that is legitimately owed to you. Regardless of the reason that the debt became delinquent, you stand a much better chance of recovering all or some of the debt with prompt action. How Do We Do It? We have developed an established method that involves a series of steps that produce proven results over and over. We make contact with the consumer that owes the debt and we put a clear plan of action together to recover your funds. We know it works because we consistently out-perform our competitors when it comes to collections. Collecting medical debts can be very complex and sometimes difficult. The debts can sometimes be enormous and recovering the debt is often critical to the bottom financial line of the hospital, doctor, ambulatory service, or other medical agency that is owed the debt. Our staff is experienced in collecting medical debts. We will work with you to tailor a package designed to meet your specific needs. Most doctor and dentist offices don't have the staff to devote to collecting outstanding debt and many hospitals can't devote resources needed to justify efforts to collect such debt. That's where Collection Bureau Associates comes in. Let us handle the hard work for you so that you can stay focused on caring for your patients. 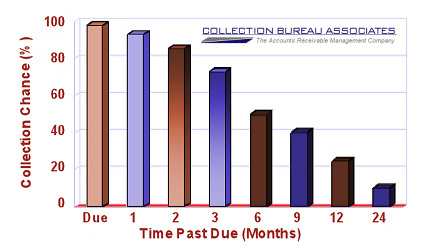 At Collection Bureau Associates, we collect at every stage of the revenue cycle. We collect pre and post charge-off. Credit account debt can be an imposing challenge to collect. We are very experienced and also very knowledgeable of the laws that govern debt collections and employ modern technology and software as well as tried and true direct contact methods. If a creditor can be found, we'll find them. Everything that we do is done with the ultimate goal in mind of collection as much of your original debt as possible. We work with you to formulate a plan of attack and acceptable concessions, if any, so that at the end of the day as much of your debt as possible is recovered and paid to you. Many times a consumer/debtor simply needs a strong urge to take care of a debt before it escalates. This is what pre-collection is all about. We will contact your debtors with a letter alerting them to the fact that their account has been escalated and that they have a chance to settle the debt before it goes any further. This type of action is usually most effective when taken when an account is 30 to 60 days delinquent. We customize our pre-collection efforts so that we adhere to all of your existing collections policies and try to help maintain a positive relationship between you and your customer. If your invoices are sent out on time and at regular intervals, you have a much better chance of receiving your payment on time. If you don't want the expense of a full time staff to handle your billing, let us do it for you. We can process any type of statement with customized letterhead and send it out on your behalf. We can customize a billing program to meet your exact needs and can also provide payment instructions to help improve your cash flow.